“In a South Carolina prison on June 16, 1944, guards walked a 14-year-old Black boy, bible tucked under his arm, to the electric chair. He used the bible as a booster seat. At 5′ 1″ and 95 pounds, the straps didn’t fit, and an electrode was too big for his leg. The switch was pulled, and the adult sized death mask fell from his face. Tears streamed from his wide-open, tearful eyes, and saliva dripped from his mouth. Witnesses recoiled in horror as they watched the execution of the youngest person in the United States in the past century. George Stinney was accused of killing two White girls, 11-year-old Betty June Binnicker and 8-year-old Mary Emma Thames. Because there were no Miranda rights in 1944, Stinney was questioned without a lawyer and his parents were not allowed into the room. The sheriff at the time said that Stinney admitted to the killings, but there is only his word — no written record of the confession has been found. Reports even said that the officers offered Stinney ice cream for confessing to the crimes. Stinney’s father, who had helped look for the girls, was fired immediately, and ordered to leave his home and the sawmill where he worked. His family was told to leave town prior to the trial to avoid further retribution. An atmosphere of lynch mob hysteria hung over the courthouse. Without family visits, the 14 year old had to endure the trial and death alone. A few years ago, a family claimed that their deceased family member confessed to the murders of the two girls on his deathbed. The rumored culprit came from a well-known, prominent White family. Members of the man’s family served on the initial coroner’s inquest jury, which had recommended that Stinney be prosecuted. The legal murder of George Stinney will forever haunt the American legacy. Although the world and this nation have undoubtedly changed for the better, race still often collides with justice and results in tragedy. Cases like George Stinney’s cannot be erased, should never be forgotten, and are an important chapter in the story of Blacks in America. “The Slavery Abolition Act 1833 ended slavery in the British Empire on August 1, 1834. Emancipation Day is widely observed in the British West Indies during the first week of August.” See Wikipedia. It’s a day worth commemorating and a day on with we should commit to freeing ourselves and all others from all forms of physical, psychological and economic enslavement. 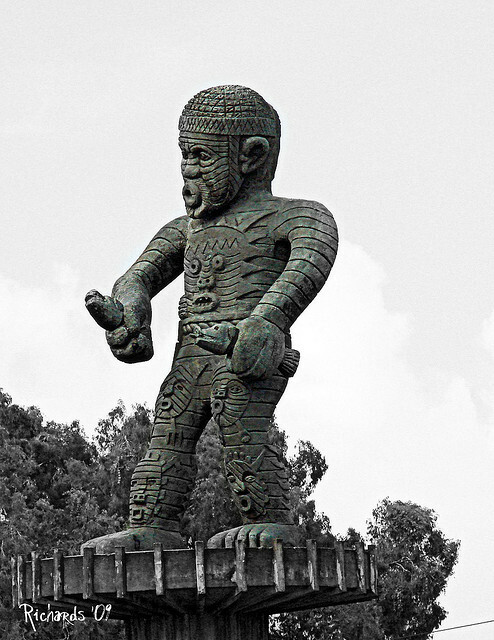 The picture is of a monument to Cuffy the leader of a slave revolt in Guyana in 1763.